Pale zones called "halos" border bedrock fractures visible in this 2015 image from NASA's Curiosity Mars rover. Measurements overlaid on the image offer a sense of scale for the size of these fractures. The rover team determined that the halos are rich in silica, a clue to the duration of wet environmental conditions long ago. The location is on the lower slope of Mars' Mount Sharp. Mars was capable of supporting life for much longer in the ancient past than researchers had thought, a new study suggests. Shortly after touching down inside the Red Planet's 96-mile-wide (154 kilometers) Gale Crater in August 2012, NASA's Curiosity rover found evidence that the area had harbored a potentially habitable lake-and-stream system in the ancient past. "This tells us that the silica found in halos in younger rocks close by was likely remobilized from the old sedimentary rocks by water flowing through the fractures," study lead author Jens Frydenvang, a scientist at Los Alamos National Laboratory in New Mexico and the University of Copenhagen in Denmark, said in a statement. "What this finding tells us is that, even when the lake eventually evaporated, substantial amounts of groundwater were present for much longer than we previously thought, thus further expanding the window for when life might have existed on Mars," Frydenvang added. The new study bolsters other Curiosity results announced in December, which suggest that, long ago, Gale may have been able to support microbial life for hundreds of millions of years consecutively. 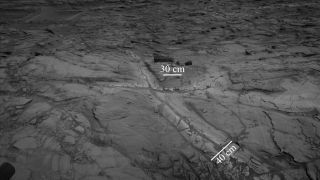 The silica halos — which Curiosity studied with its cameras, X-ray spectrometer and laser-firing Chemistry and Camera instrument — lie on the lower north slope of Mount Sharp, a 3.4-mile-high (5.5 km) mountain that rises out of Gale Crater's center. Curiosity has been climbing through Mount Sharp's foothills since September 2014, analyzing the rock layers along the way for information about Mars' evolution from a relatively warm and wet world long ago to the cold and dry planet it is today. That shift is associated with the loss of Mars' thick, carbon-dioxide-dominated atmosphere. Fast-moving solar particles had stripped away the vast majority of the Red Planet's air by 3.7 billion years ago or so, according to observations by NASA's Mars Atmosphere and Volatile Evolution orbiter (MAVEN). This solar stripping began in earnest shortly after Mars lost its global magnetic field, which had served as a shield against these solar particles, MAVEN scientists have said. Curiosity has now traveled more than 10 miles (16 km) on the Martian surface. The record for the longest distance covered on an alien world belongs to Curiosity's older, smaller cousin, Opportunity, which has racked up 27.86 miles (44.8 km) since its January 2004 touchdown. The new study was published online today (May 30) in the journal Geophysical Research Letters.